Hello out there in internet land and happy New Year. Like me I am sure that you will all soon be back to work and back into the usual routine. I don't normally go for New Year resolutions but this year I am going break with tradition and give myself one. Yes, I am sure you have guessed it is Brompton related. I plan to ride my beloved Brompton every day to work, regardless of weather. (Snow and ice being the only exception to this rule). I really want to see how long I can keep this up without resorting to the dreaded car? 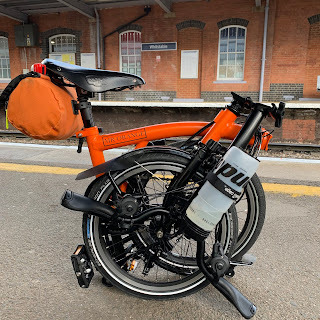 So, if you have a Brompton or any other bike for that matter, take the plunge and have a go yourself. You might surprise yourself at how the simple joy of cycling home can allow you to unwind from the rigours of the day. Watch this space for the promised review of Brompton related items. Happy New Year and just think, there is a Brompton World Championship to try and enter this year!